Have you found that drunken ram riding and wanton slaughter just aren't enough to properly celebrate Azeroth's Brewfest? Why not celebrate the holiday in real life with this two-liter replica of the in-game Tankard O' Terror beer stein? I really want to meet the man who decided that of all the World of Warcraft merchandise out there, the one things that we were missing were beer steins. I want to meet him, and I want to hug him, because I love these things. I've got a Horde stein here on my desk (despite my allegiance to the Alliance - I have to admit it just looks better) but sadly, would never drink out of it. It's for admiring, not for imbibing! Not so with the Tankard O' Terror. 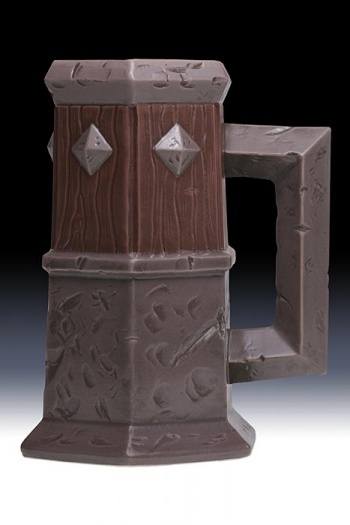 This replica of the in-game item (dropped by Coren Direbrew in Blackrock Depths) is pretty beastly: It weighs over 4 lbs (1.8 kg), stands 9 3/4 inches (24.8 cm) tall, and holds two liters (1/2 a gallon) of your brew of choice. Does it do 171.5 DPS, buff your Agility by 47 and Stamina by 37? Well, it doesn't say on the site, but let's just assume it does. "The Tankard OÂ¹Terror is truly massive in size, weight and capacity, and will be a lot of fun for World of Warcraft enthusiasts," said Jerry Bennington, president of 3 Point Entertainment - the company behind Taverncraft. "ThereÂ¹s never been anything quite like it, and IÂ¹m confident players will enjoy using their tankards to celebrate alongside their in-game characters." Sadly, though I'm sure Mr. Bennington meant well, he's not entirely correct. Since the in-game Brewfest ends October 3rd, if you're looking to get your stein and celebrate by getting smashed in real life alongside your WoW character, you're out of luck: For the moment, the manufacturers are only taking preorders - the real things won't ship until mid-November. Still, you could always get one in preparation for next year, right? Or better yet, since they're non-unique, one-handed items - not to mention that at $40, they're less than half the price of their more ornate, decorative cousins - get two and dual-wield. Yes, you heard me right: Dual-wield a total of four liters of your alcoholic brew of choice. It's so pure I think I'm going to cry. DO WANT epic tankard is epic, Are they bind on pick up? Mountain Dew and Coke mixes will do I guess. Question, are these suitable for throwing at Dark Iron dwarves? My warrior has one in his bank right now. I remember last brewfest where I would fight my friends with our dual wielding mugs. I've spent the last few weeks wondering to myself, "What is my life missing?" It wasn't until now that I realized the answer was, "A massive tankard that inspired pants-shitting terror in all who behold it." If these things end up as a North America exclusive I'm going to murder someone. This...is the greatest thing I have seen in a long time. I must buy it now! Epic. I've had a can of becks sitting next to me every brewfest. Be nice to have an epic tankard to keep it in. $40 + shipping. I bet shipping to the UK will be a killer though at that weight - a sack of spuds through the post? Ouch. Getting one as soon as I can. I need a new Tankard anyway. Oh me likey, and me wantey, must haves it. Figures though that sweet things like this come up when I'm tight on the cashflow. Mountain Dew is an awesome substitute for beer, so don't feel like you are dissing the real thing. As for throwing one at a Dark Iron dwarf, I would say sure, at that size and weight you would be sure to crater their skull. Wow, I would never buy a video game's merchandise, but this is the closest I've ever been. It's absolutely awesome. Do the peeps here get paid to advertise these things? As a maces rogue, I am actually weilding the in-game version right now. This makes my purchase of this incredible vessel of intoxication not only mandatory, but awesome. I got the alliance and horde steins... I'll be skipping this one. I've drunken from them both, Arrogant Bastards no less-- you gotta break them in. A little tricky to wash but well worth it. I also want a drinking horn too. I don't know--I'd prefer my drinking vessel not to look like Satan's Strap-On. Y'know what it reminds me of? I'd show you, but I can't link to the picture. I feel you there Funk. It's stuff like this that makes me consider actually paying to play WoW. I think his friend will now hate you for doing that to him on the interwebs. Still, Its... Well, it just looks like a hunk' o plastic to me. I'd rather have a real, metal beerstein to me. ... How heavy is it? With my alchoholic beverage in it, it could get pretty heavy. well, 25 bucks for a 1-liter mug (beer included) for oktoberfest makes this sound like a nice deal, if only I got free shipping. Or a beer included. I could have gotten the 5-liter for 75 dollars, with beer. I could have! What's more frustrating is that they HAD to make it a mace so my warlock can't equip it. BLAST! I'd be down for one if it has a better + to spirit and/or block than my current. I'm already saving up for a silver goblet, unfortunately. Its plastic. They could of made a real one or one that looks more real. Cheap assholes at Blizzard. And what a sweet drinking horn. Oh..... oh god. I would take this to the local bar and be the king of all! Or thrown out for riding in on a bear. It's not plastic, actually. It's stoneware.